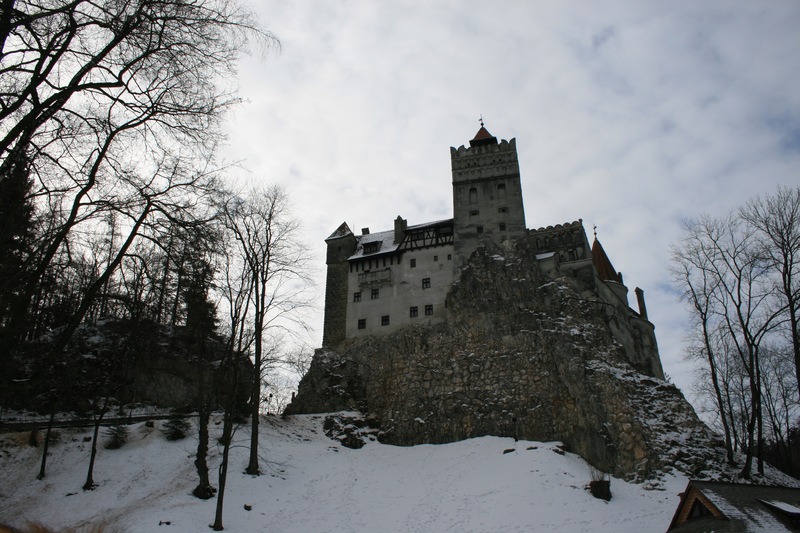 We booked an excursion with Dracula Tours to go visit Bran castle and Peles case. When the taxi driver picked us up he asked if we wanted to visit Rasnov fortress as well. Peles was unfortunately closed but you can still wander around the grounds. Peles is absolutely stunning, although it was February the castle was dressed up in Christmas decorations ready for filming to begin in a few weeks. Apparently its commonly used in Hollywood productions and you can totally see why. On the grounds there is also a beautiful manor style house which we later came to learn was actually built as a home for a mistress only a few hundred meters from the main castle. Next on the agenda was Bran castle, the home of Dracula. Well Vlad the impailers summer home but most people only know the castle from the books. If you visit Bran, before walking up a million stairs to the castle walk through the gardens at the bottom to get by far the best view of the castle. Or if you’re like Hannah the best selfie opportunity. I think getting into the castle was around about the equivalent of £5. If you go in winter make sure you are well wrapped up, it is by no stretch warm. Our driver was actually very knowledgeable about the history of Bran and well Romania in general to be honest. You get a mix of history from Bran castle there is a lot of information to take in about the old royal families and the myths and legends of Vlad the impairer so make sure you leave plenty of time to explore its really easy to miss bits. I think we were there for around and hour and hour and a half, but to be fair we do tend to mission it around a little. Finally we went to visit Rasnov Fort, I would definitely recommend swinging by just for the views alone. Apparently it was the only fortress in Europe to have never of had the walls breeched. Someone has made some attempt to restore areas of the fort but for what ever reason it wasn’t completed. This does add to the character to be fair i personally don’t like to see old buildings and structures rebuilt to there former glory it takes away some of their charm. One of the coolest things about Rasnov fort, there is a 120m deep well in the middle of the Keep which was dug by hand by two Turkish prisoners by hand. I think in total we were out for 5 to 6 hours, and our driver even took us the scenic route back to show us through the ski resort which was nice. We did have to pay entrance to Bran castle and the fort on top which really was a small amount but it was 300 Leu or around £60 for both of us for the day. Cant moan at that now can you for a days exploring. Previous Brasov – Day 2, The little old town.